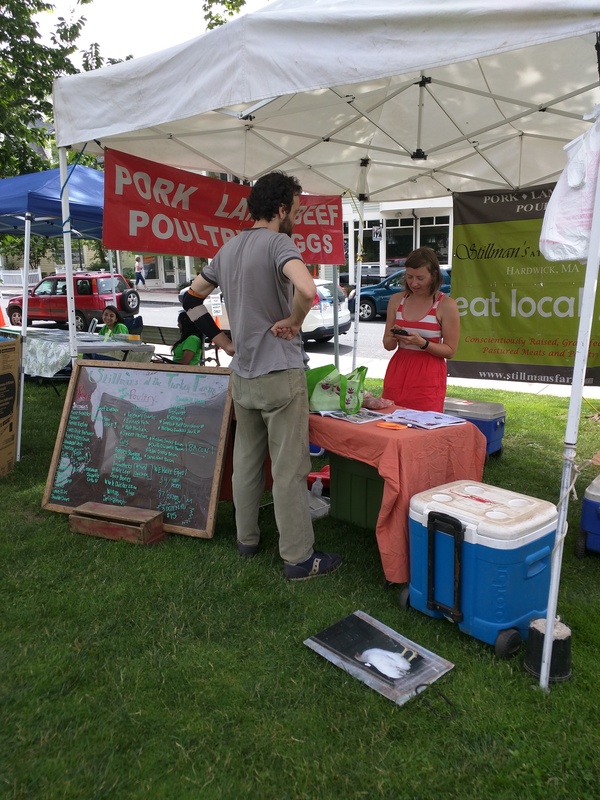 We’re at the very end of July and almost halfway through the Market season! As I’m sure we’ve all noticed, we’re in the heart of summer, so our number of vendors are expanding. While checking out our new layout at the Market of three aisles of vendors, you’ll be immersed in the folk and bluegrass music of Greg Hall & The Barnhouse Band, playing from 3-6PM. Also, parents: mark your calendar! The August 13 Market will feature lots of kids’ activities! We’ll have more details soon, but plan to bring young ones along for afternoon entertainment. Blake Orchard Juicery – Organic juices and nut mylks: The Insomniac (apple, celery), Glow (carrot, orange), Clean Buzz (beet, pineapple, celery, ginger), and Vanilla Almond Mylk. I Can With – FRESH fire-roasted corn and peach salsa, and berry-jalapeño lemonade; PLUS bringing local produce from Outlook Farm! Just Jane’s Jams – Pepper jelly this week; also, blueberry-pear, and the first peach jam of the season, as well as other artisanal jams hand-crafted from local fruit, plus low sugar varieties. Of The Earth Farm – Tomatoes, sweet corn, cukes, squashes, cabbages, berries, peaches, jams, and their special butternut squash seed oil. People’s Bakery – Crusty sourdough breads, Kalamata olive rosemary, spinach and roasted garlic, peasant French, cranberry pecan, plus spelt sandwich breads and sweet bread of the week. Wickedly Wild Gourmet Spices – New this week: BBQ peanuts and spicy ranch dressing! Plus gourmet barbeque sauce in “sweet” and “spicy” varieties; specialty cooking spices, rubs, and dips made with no additives, preservatives, coloring, MSG, or gluten. 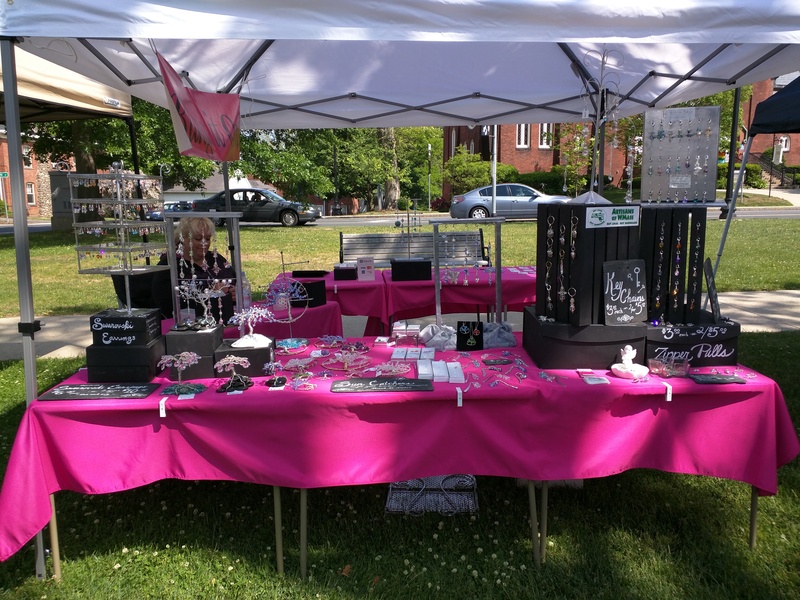 Bling It On – Crystal jewelry, sun catchers, bookmarks, hair pins, key chains, glass prisms, sculptures and more. 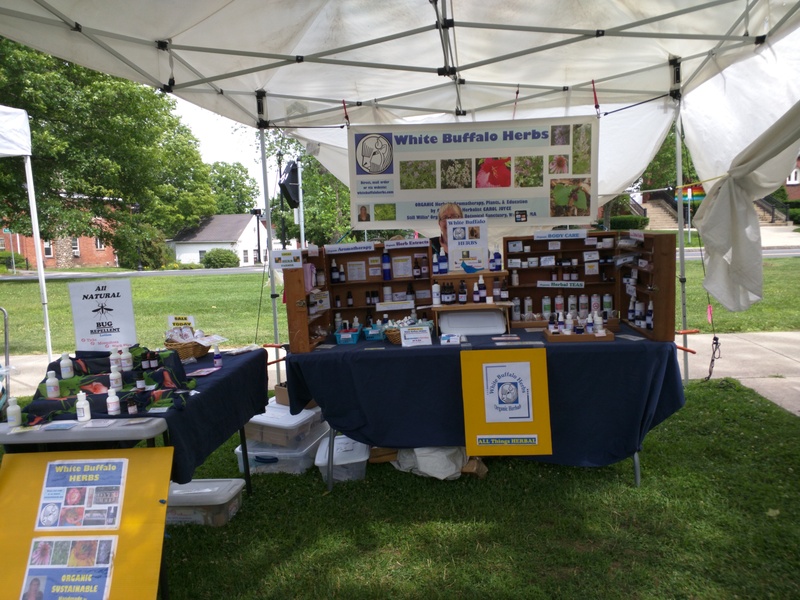 White Buffalo Herbs – Carol will introduce her newest herb tea: Anise Hyssop & is featuring her fresh batch of St Johnswort Oil (come by to see how it is made), PLUS all things Herbal: i.e.Organic teas, extracts, cooking herbs, body care, Aromatherapy, even bug repellent! It looks like there’ll be some scattered thunderstorms tomorrow, so bring an umbrella in case! Leave a comment The Last July Market! We’re so excited for tomorrow as this week’s market is going to be amazing. 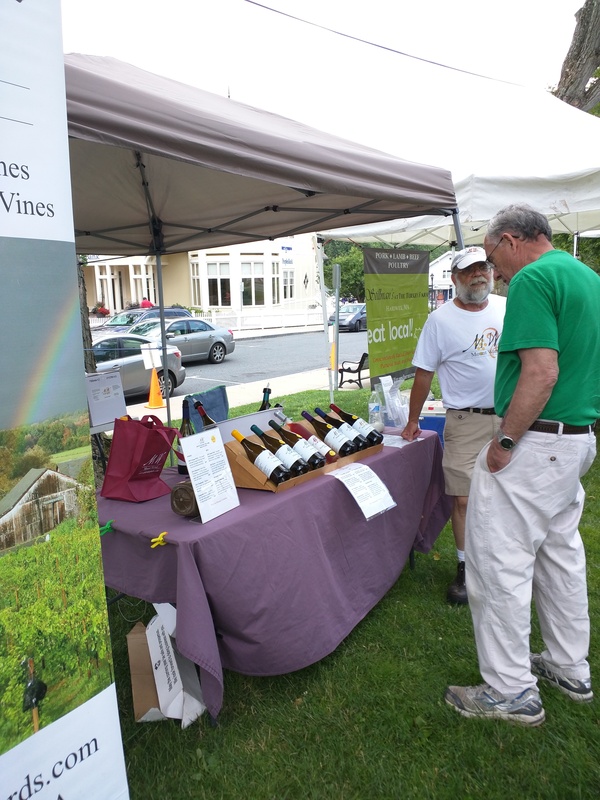 We’re welcoming a new vendor, Stoneybrook Cider, as well as welcoming back our two new produce vendors from last week: Of the Earth Farm and Sentinel Farm. Along with vendors, we’re welcoming back Market favorites: Center Nursery and Lexi Weege. The Nursery will be at the Market from 3-6PM with crafts for kids, while Lexi will be performing from 2-5PM. 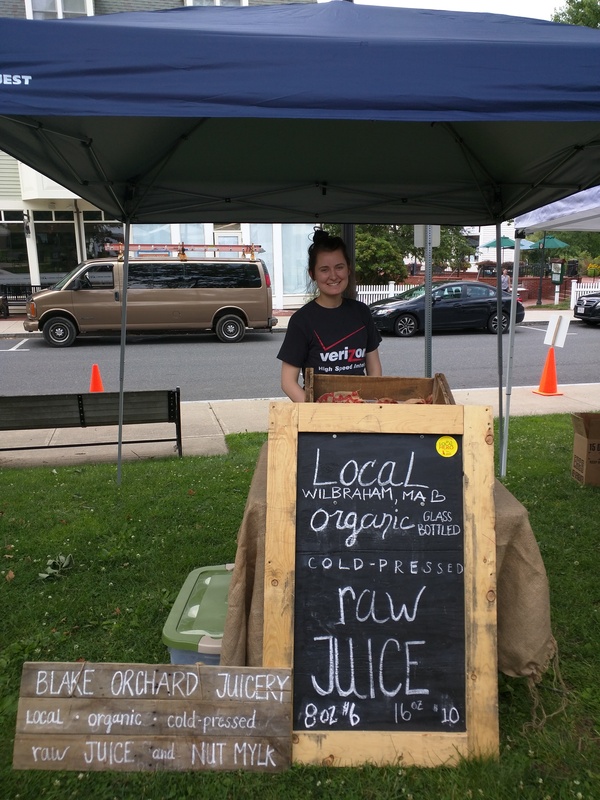 Blake Orchard Juicery – Organic juices and nut mylks: Skin Cleanser, Doctor’s Dose, Clean Buzz, Chocolate and Vanilla Almond Mylk. I Can With – Featuring fresh blueberry salsa made from local produce; PLUS bringing local produce from Outlook Farm! 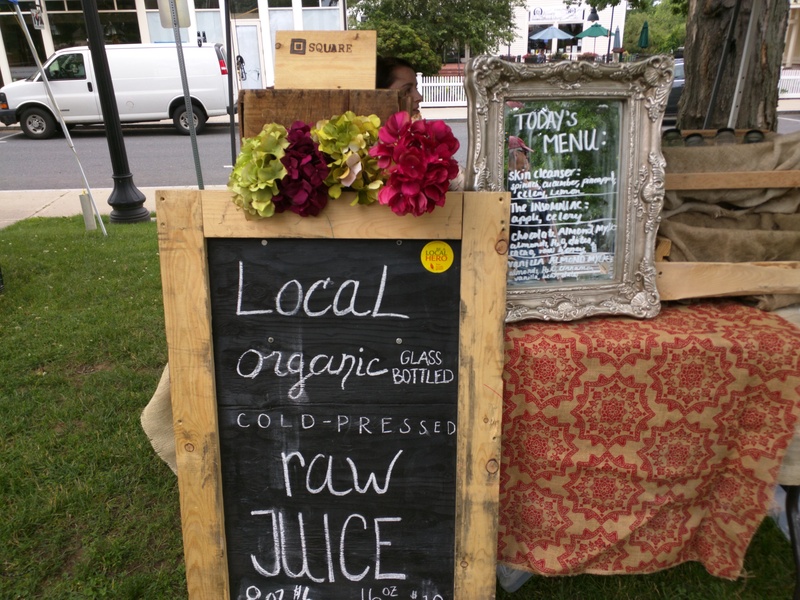 Of the Earth Farm – A variety of local produce grown without chemicals. 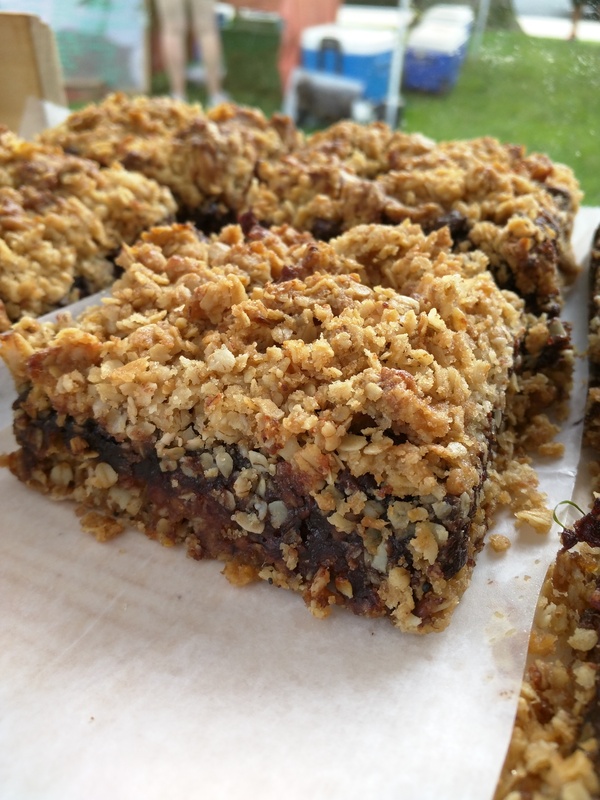 People’s Bakery – Crusty breads: sourdough, kalamata olive rosemary, spinach and roasted garlic, peasant French, cranberry pecan; spelt sandwich breads, PLUS plus a sweet quick bread of the week. Sentinel Farm – Early peaches and honey. 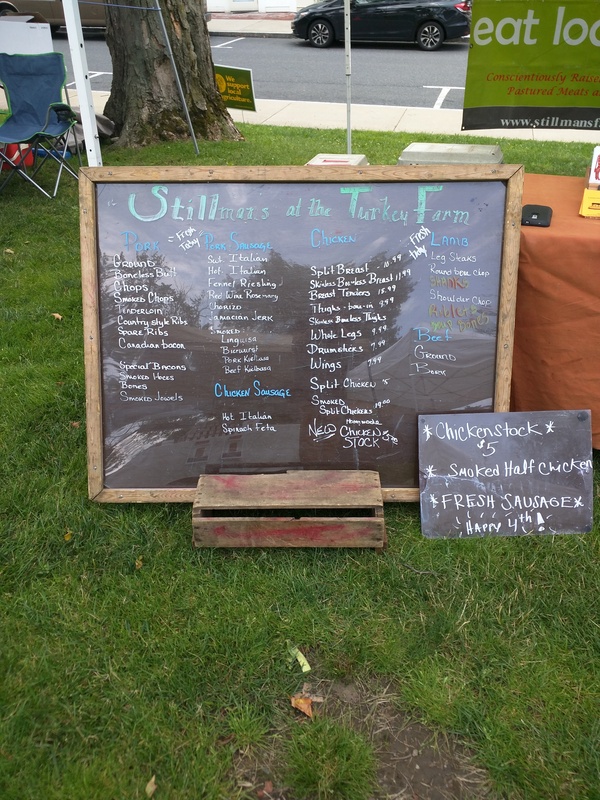 Stillman’s Quality Meats – Fresh variety of chicken sausages, grass-fed beef, pastured pork and chicken, AND lots of bacon varieties. Stoneybrook Cider – All-natural hard cider crafted in the New England tradition with apples hand-picked from orchards in the Pioneer Valley. Wickedly Wild Gourmet Spices – Introducing poppy seed dressing this week; gourmet BBQ sauces, specialty cooking spices and dips made with no additives, preservatives, coloring, MSG, or gluten. 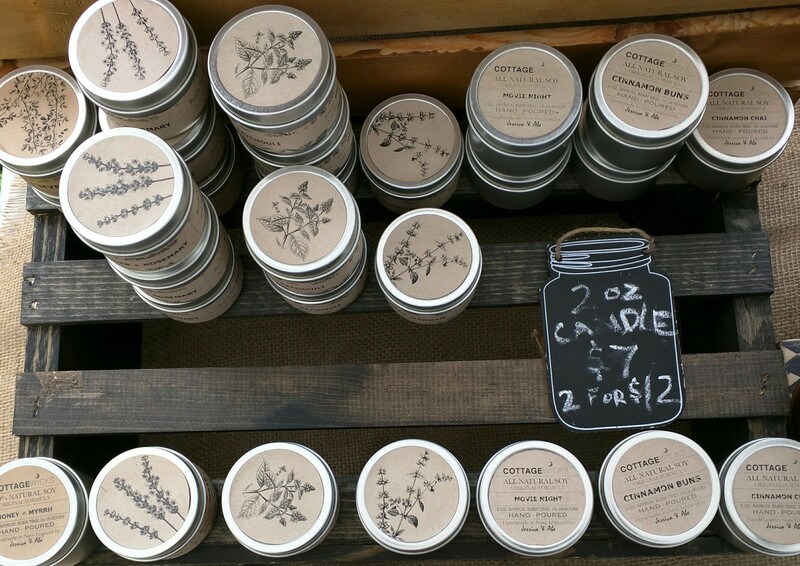 CottageWicks – Natural, organic soaps, lotions, and salves made with essential oils; 100% natural, non-toxic soy candles​. White Buffalo Herbs – Organic herbal creams, teas, spices and oils. Center Nursery School (3:00 pm) – Crafts for kids. Tomorrow is a beautiful day-we can’t wait to see you! Leave a comment July 23rd! Tomorrow we’ll be welcoming our new vendor, I Can With, who will be bringing their fresh salsa, as well as local vegetables from Outlook Farm! We’ll have a Market favorite returning with early peaches and honey: Sentinel Farms! We’ll also have Taproot Threads, with beautiful, original designs screened on responsibly sourced clothing. 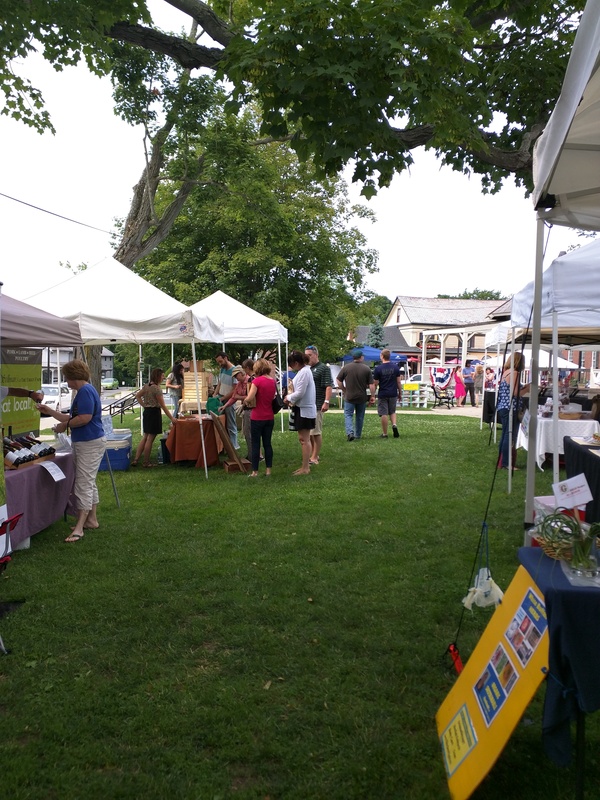 As always, some of our vendors will be joining us every week, some will join every other week, and others will be making special appearances throughout the season. Make sure to sign up for our newsletter as well as like our Facebook page to receive updates. 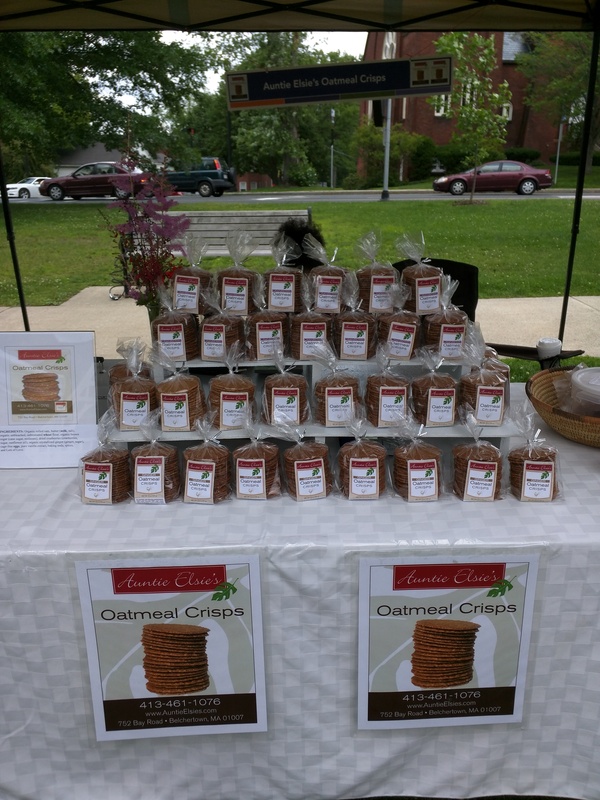 Auntie Elsie’s – Original, ginger, and cranberry oatmeal crisp cookies. Auntie Elsie’s is also a favorite! Blake Orchard Juicery – Iron Man, The Insomniac, Clean Buzz, Chocolate Almond Mylk, Vanilla Almond Mylk. I Can With – Fresh, made-to-order salsa using a mild base and locally-grown produce; PLUS bringing local produce from Outlook Farm! Just Jane’s Jams – Low sugar strawberry rhubarb jam freshly-made with local produce; low sugar raspberry rhubarb; strawberry vanilla cream; original recipe strawberry/raspberry, blueberry/raspberry, milk chocolate strawberry, and more. Mt. 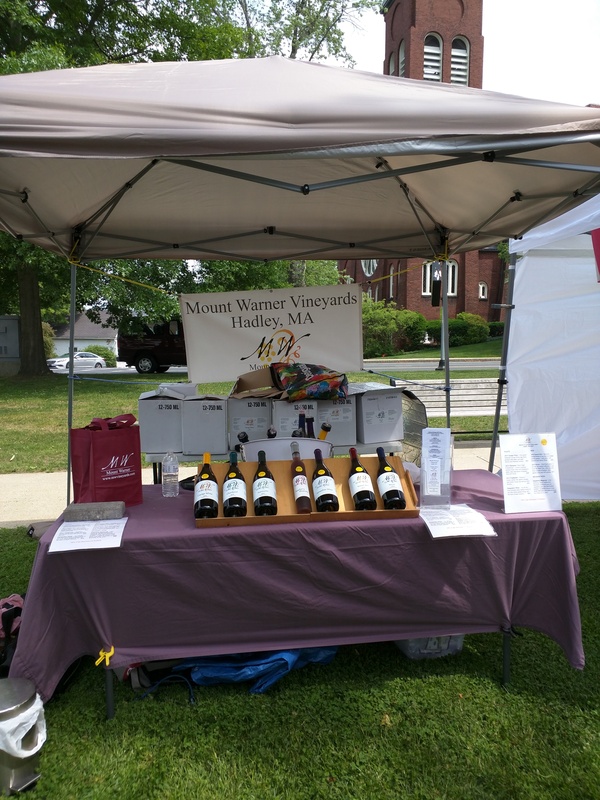 Warner Vineyard – Award-winning wines from grapes (and raspberries) harvested from their own vineyard in Hadley, MA, including Cayuga White, Chardonel, and Sunset Red; Raspberry Rhapsody port-style dessert wine (great with dark chocolate – but what isn’t!). 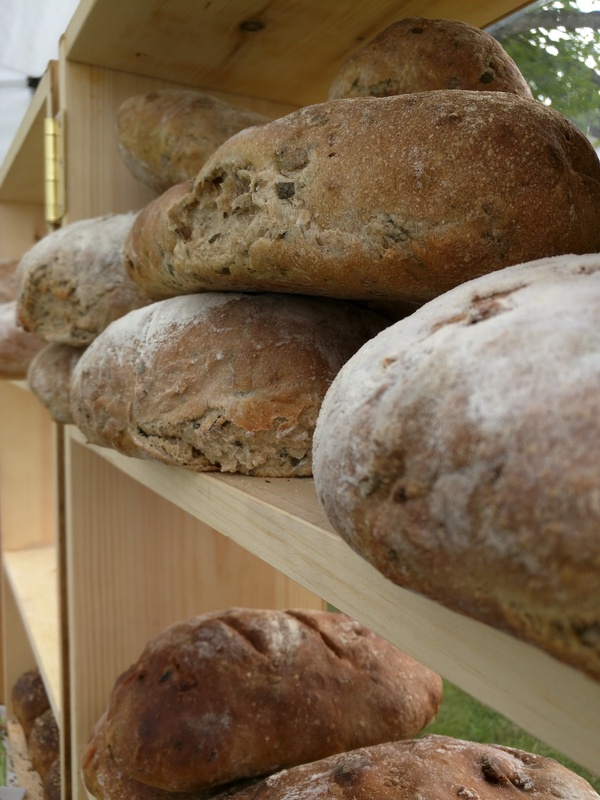 People’s Bakery – Crusty sourdough breads, Kalamata olive rosemary, spinach and roasted garlic, peasant French, cranberry pecan, plus spelt sandwich breads. It’s easy to see why People’s is a Market favorite! Stillman’s Quality Meats – New chicken sausages: Jamaican Jerk and chicken pesto; fresh chicken cuts; sausages for the grill. Stillman’s is always popular at the Market! Wickedly Wild Gourmet Spices – Wickedly Wild Gourmet Barbeque Sauce and specialty cooking spices and dips. All spices are hand-packaged and labeled in Granby, MA, and contain no additives, preservatives, coloring, MSG, or gluten. 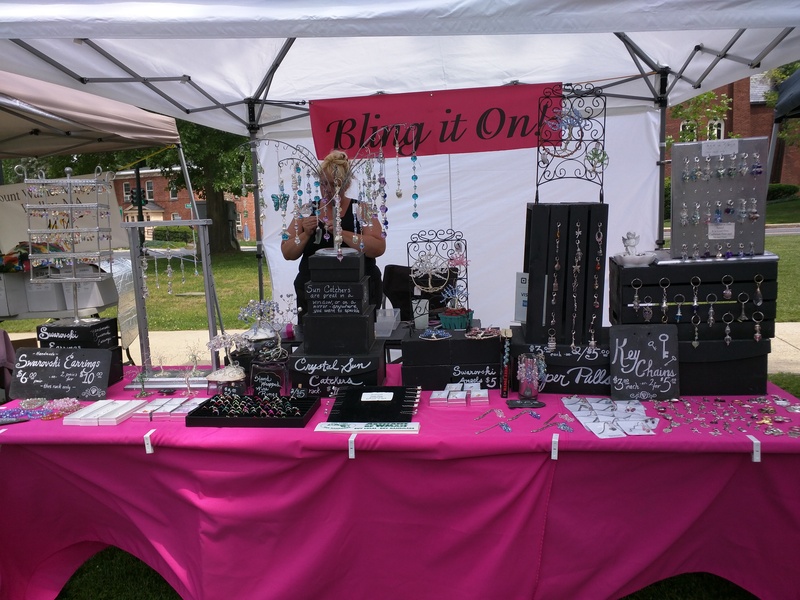 Bling It On – Sun catchers, bookmarks, hair pins, key chains, handmade bracelets, glass prisms, rings. Bling It On’s eye-catching display! 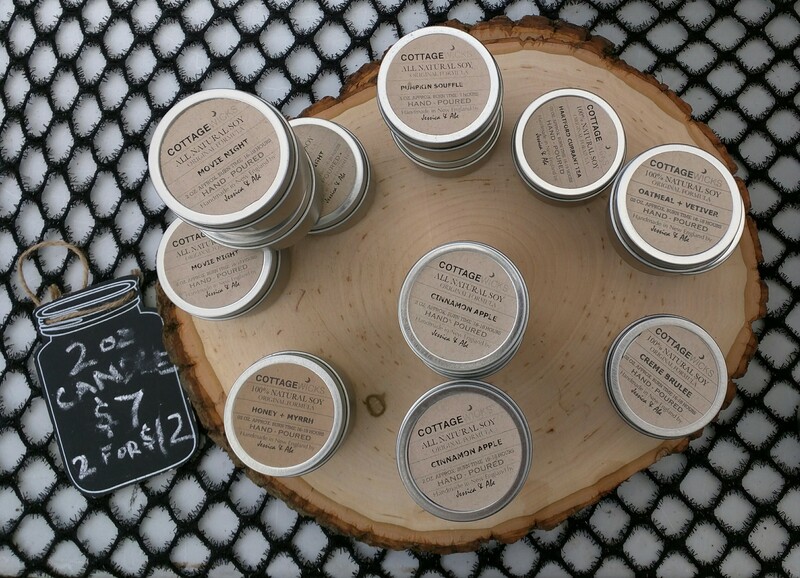 A small sampling of Cottage Wicks many 100% natural products. 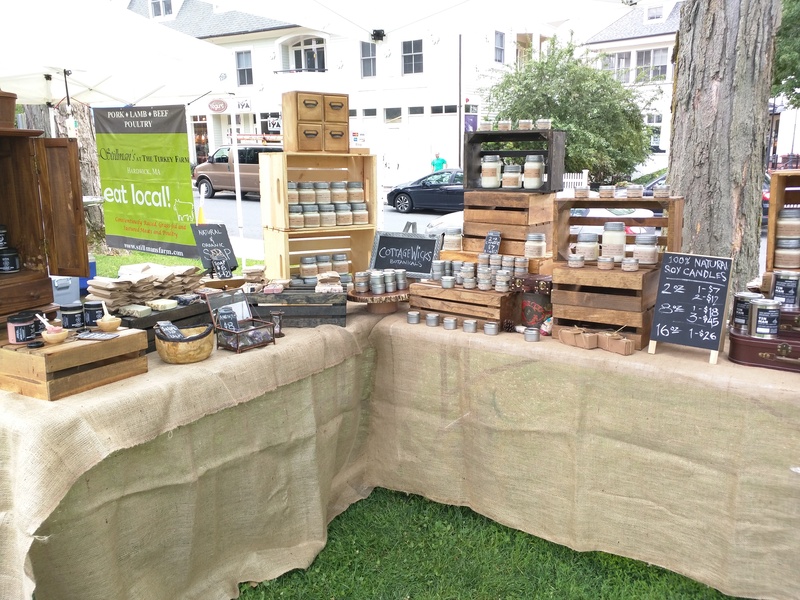 The DandiLyon Group: Pioneer Valley Vinegar and Jane Lyon Jewelry – Herbal infused vinegars, cider, rice, and malt vinegars; hand-cast artisan jewelry. A small sampling of their pieces! Taproot Threads – Original screen printed designs on sustainable cotton clothing. 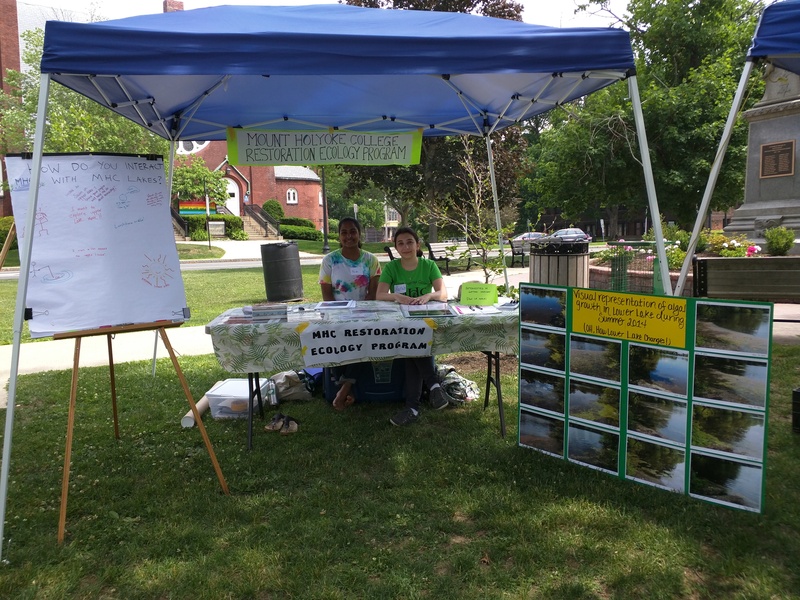 Mount Holyoke College Restoration Scholars Program – Stop by to learn about the FREE restoration ecology summer program for high school girls, taking place from July 20-24. Masala Jazz, 2-4 pm, playing a fusion of musical expressions with a foundation in jazz and blues. Leave a comment July 16th Market! Tomorrow we’ll be welcoming a new vendor: Wickedly Wild Gourmet Spices! They’ll be seriously spicing up the Market with Wickedly Wild Gourmet BBQ Sauce, a sweet and spicy BBQ sauce made with top shelf Kentucky Bourbon, brown sugar, honey, locally grown veggies, and home grown spicy habanero peppers. Also try their ranch dressing, spinach dip, fiesta dip, veggie dip, BBQ rub, Greek rubs, Greek dressing, spicy Southwestern dip, and Mediterranean lemon dressing. We are in the process of securing new produce vendors, and could use your help! 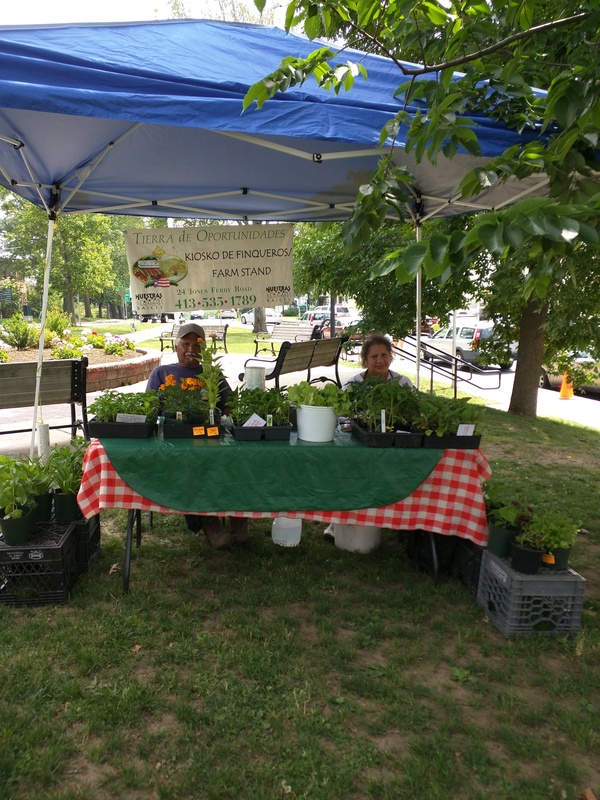 Dave’s Natural Garden will not be returning to our market. We know this is disappointing to many people — it’s disappointing to us as well. We have contacted a number of farmers and produce vendors, but know there are more out there! Nuestras Raices will be sending different farmers soon, once they have enough product. A couple of other small growers will be joining us later in the season as well. If you know of a farmer who you think would do great at our market, please contact Ann, the Market Manager, at shfarmersmarket@gmail.com. Despite the unfortunate lack of produce, we’re still going to have a great market with a musical performance by Masala Jazz, featuring music with foundations in jazz and blues. Stop by to speak to Gary and sample some of his amazing wines! 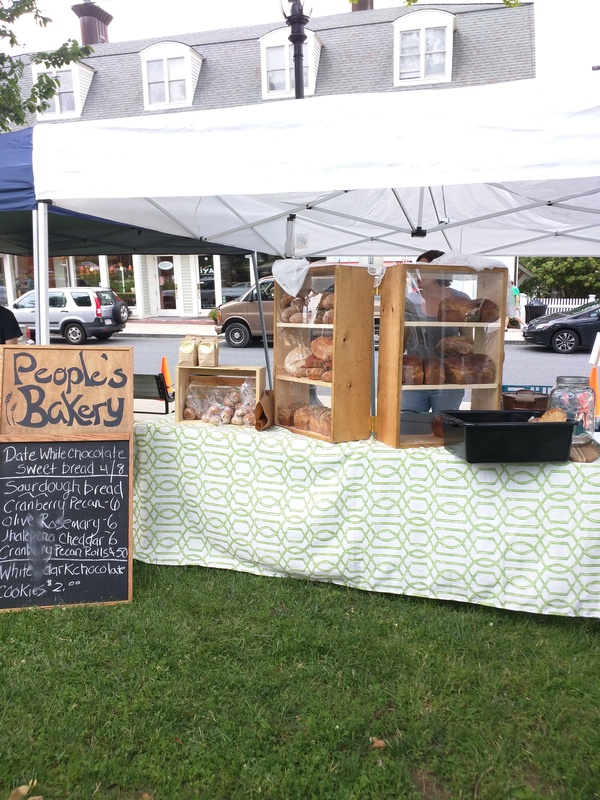 People’s Bakery – Crusty sourdough breads, Kalamata olive rosemary, spinach and roasted garlic, peasant French, cranberry pecan, spelt sandwich breads, and cookies. The always popular People’s Bakery! Stillman’s Quality Meats – Spinach feta chicken sausage, bratwurst, bacon, and fresh meat. 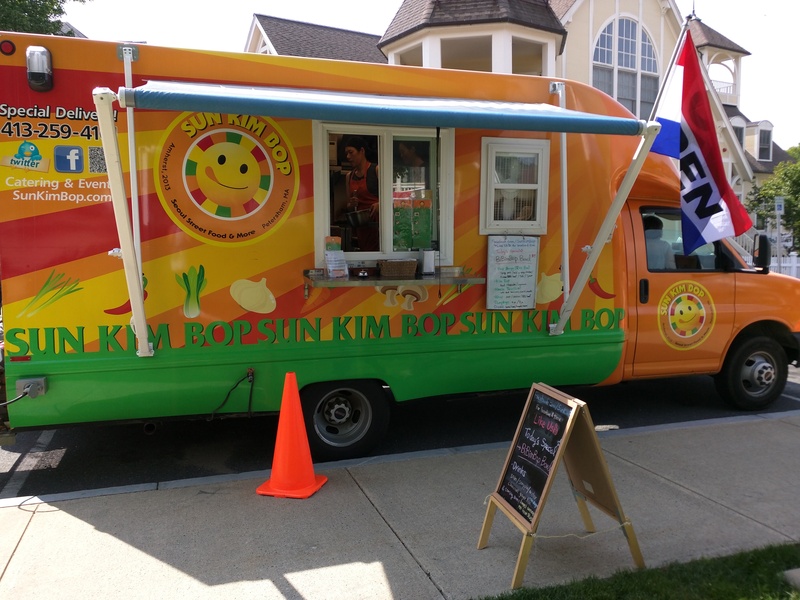 Sun Kim Bop (1-3 pm) – Korean fusion street food truck – Look for the truck in the traffic circle right in front of the Common! Sun Kim Bop’s specials change daily, so check our Facebook to see what they’ll have tomorrow! Bling It On’s bright, beautiful set-up! If you haven’t already, make sure to check out Cottage Wicks’ Etsy store! 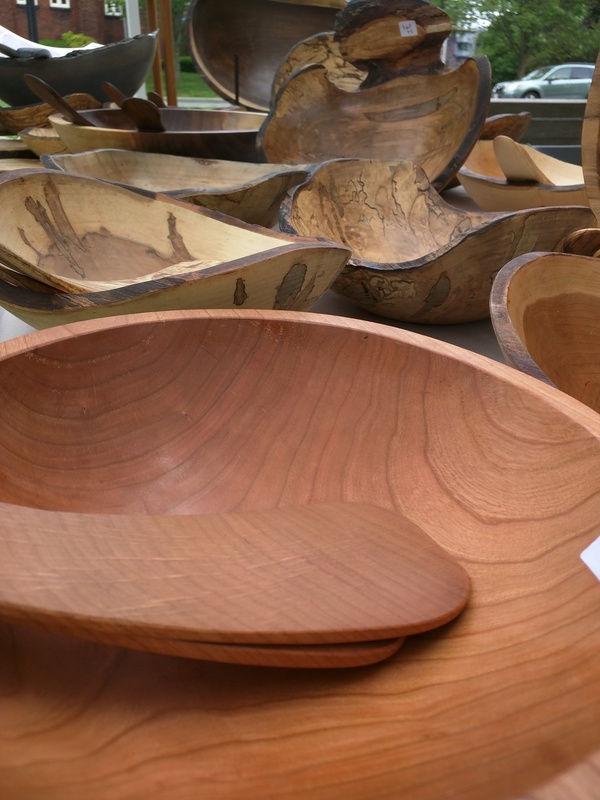 Peterman’s Boards and Bowls – Handcrafted cherry, spalted and ambrosia maple, black walnut, cherry burl and ebonized products made from local upcycled wood. Also showing the new “Driftwood” line of bowls. 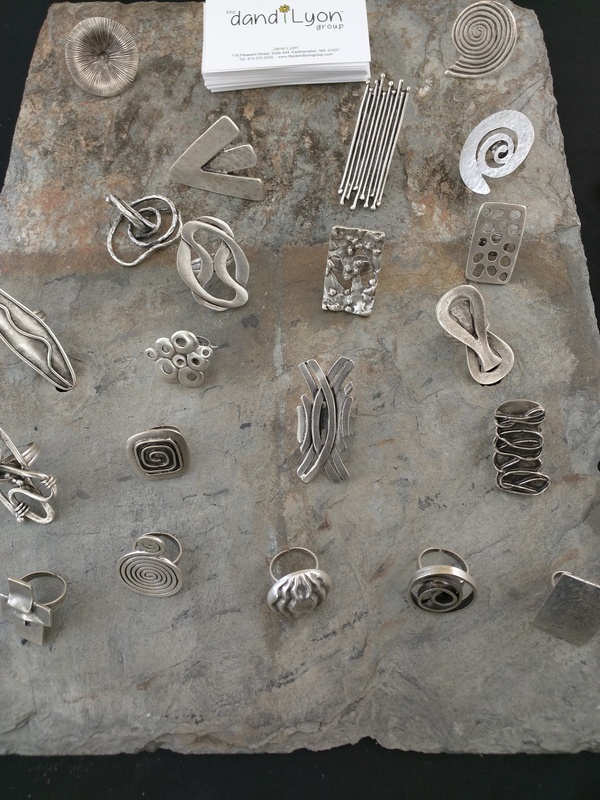 A close-up of some beautiful pieces. 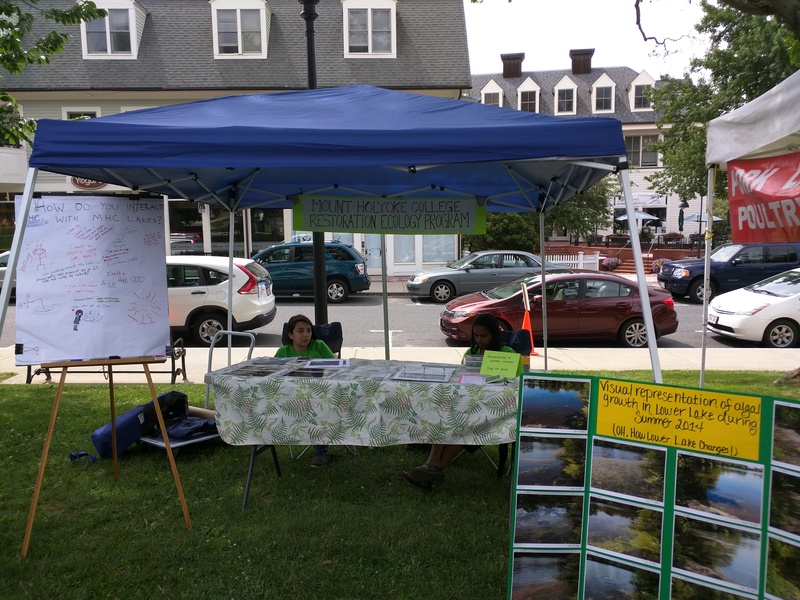 Mount Holyoke College Restoration Scholars Program – Stop by to learn about the FREE restoration ecology summer program for high school girls, taking place from July 20-24th. Masala Jazz (2-4PM)- MASALA is a term used in Asian cuisines to mostly describe a combination of wonderful spices. Not unlike the mixture of the many spices in Indian cooking, Masala Jazz’s music is a mixture of many musicians and a fusion of musical expressions with a foundation in jazz and blues. We’re starting off July with quite a full market tomorrow! 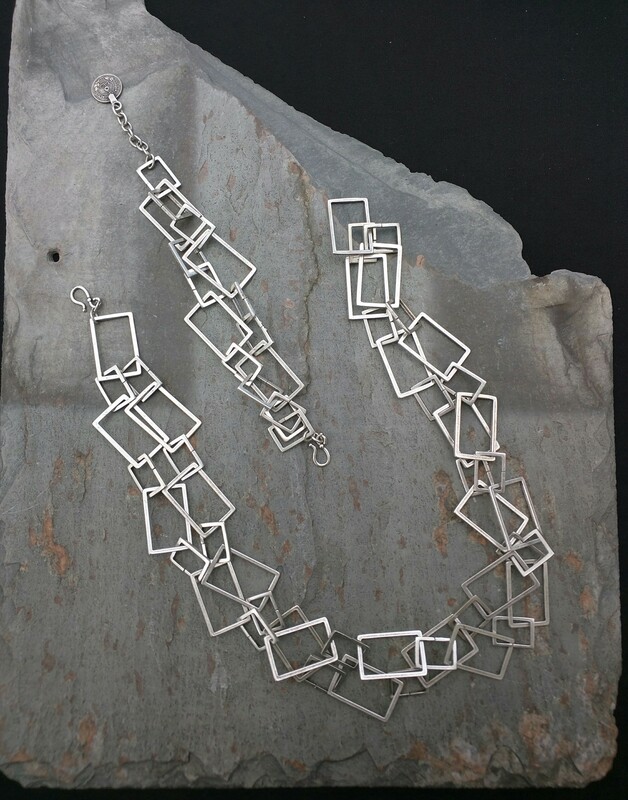 We’ll be welcoming The DandiLyon Group: Pioneer Valley Vinegar and Jane Lyon Jewelry. The DandiLyon Group was founded by Jane Lyon of Easthampton, MA, owner of Pioneer Valley Vinegar Works. We are proud to celebrate and serve the womenʼs community of Western Massachusetts by promoting special events featuring women’s music, art and literature. Check out their website if you’d like to learn more about the Group and their philanthropic mission! And of course be sure to come by tomorrow to check out their herbal infused vinegars and hand cast jewelry. Tomorrow, we’ll be welcoming back Just Jane’s Jams, a Market favorite from last season! We’re also happy to present Carson O’Keeffe & Jack Dwyer , Pioneer Valley based musicians.They’ll be performing from 2-5PM, featuring folk, alternative folk, and acoustic music. Both believe deeply in the necessity of sharing trust, vulnerability, and humility with their audience through cultivation of safe shared space. Their songs speak with ingenuity of the beauty and suffering inherent in human experience. Blake has been incredibly popular this Market season! They sell out of many of their flavors each week. Nuestra Raices comes with beautiful produce and potted plants! Everyone missed People’s so much last week that they came back with even more delicious, baked goods! Carol grows all of the herbs herself on her organic farm! Leave a comment First Market of July!